Grown as a compact upright cordon, Starline 'Blue Moon' is a versatile apple tree that is ideal for container growing or small gardens. 'Blue Moon' is a fantastic, heavy-cropping, modern apple variety that produces eye-catching purple-blue apples. Cropping in August and September, the apples have crisp and juicy flesh with a delicious sweet and sharp flavour. 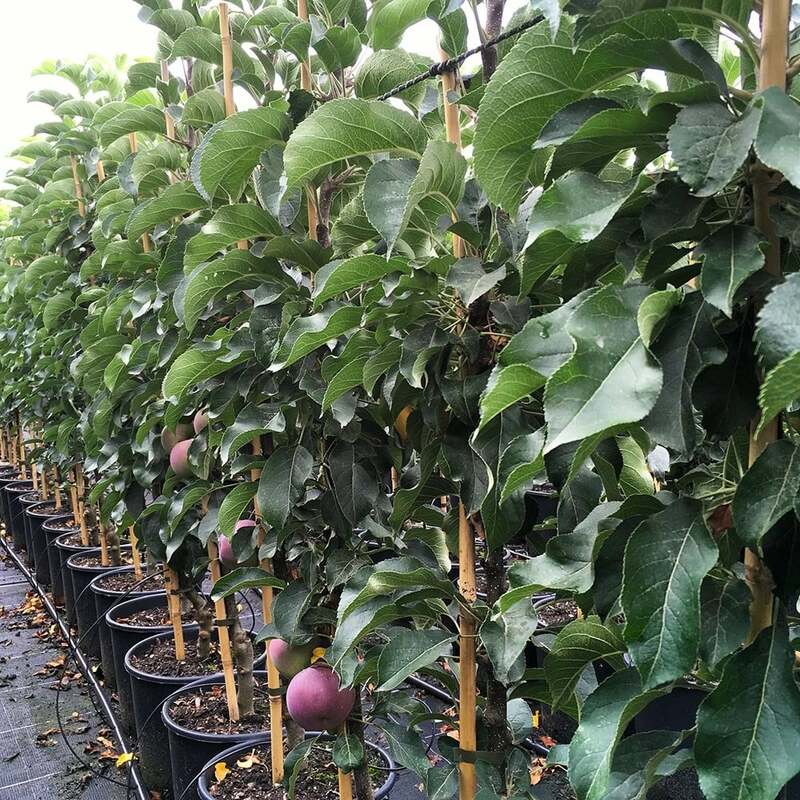 This columnar apple tree grows to just 2 metres high and 40cm wide, so combined with the pretty spring blossom and attractive purple-blue apples, it a winner for adding interest to patios. 'Blue Moon' is also ideal for planting in rows or creating your own mini orchard! It benefits from being self-fertile and having excellent disease-resistance. Blue Moon columnar apple trees are self fertile so don't require another tree for pollination, but if you want to plant several then they can be positioned just 60cm apart. They are pot grown so can be planted at any time of year, whereas bare root apple trees can only be planted in November to March. If you’re planting Blue Moon in spring or summer, water well and regularly for the first few months. If you’re planting in autumn, you may only need to water a little. Keep an eye on young fruit trees and increase watering if there are periods of hot or dry weather. Keep the area free of competing weeds and grass for the first few growing seasons. The guide linked to above provides further advice. Our Blue Moon cordon apple trees will already have a central leader. Simply prune to maintain the shape of the tree if required and remove any diseased or damaged branches. Carry this out between November and March. Rootstock: The rootstock of a tree defines the height that it will eventually reach. All fruit trees can be pruned to control their height but it is advisable to choose a rootstock most suited to your needs in the first instance.